(combined retail value of over $100) only $19.99 with a purchase of $30 or more. If purchasing the kits only $29.99. Supplies are limited so hurry in. Gift Certificate Sale: Get $5 added to every $20 increment gift certificate you purchase. For example a $20 certificate becomes $25, a $40 certificate becomes $50. No other Discounts apply to the above sales. get 10-40% OFF your entire purchase. Above sales will not be in addition to this discount. A free 6x6 paper pack with every purchase will supplies last. I apologize for not having our Silhouette Cameo's on special. We had planned on this being a big Sale for tomorrow, however, the NEW Cameo's have been delayed in shipping. We WILL have them soon and will have a special sale on them, so keep them on your Christmas List. We do have a Cameo and 3 Portraits currently in stock. 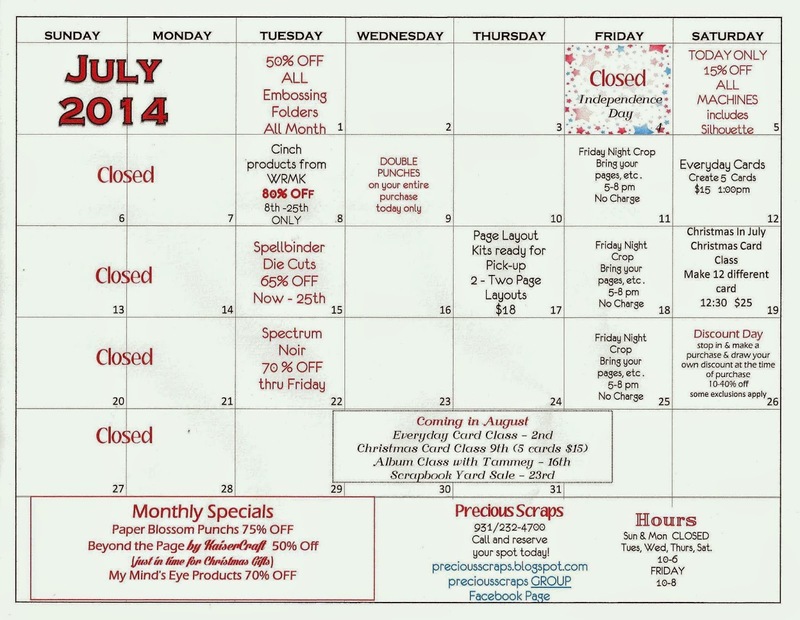 Here is July's schedule with all sorts of great things going on. Something to think about; I have someone who can teach a "Project Life" Class and/or host a "Monthly Book Club" Class. Please let me know if you are interested in either class so we can decide to add them to our schedule or not. Thank you. Look out June ! We are having some great Sales ! We are clearing out to make room for NEW, NEW, NEW ! So we need your help. Stop in this month and take advantage of some great deals ! Hope to see you soon ! 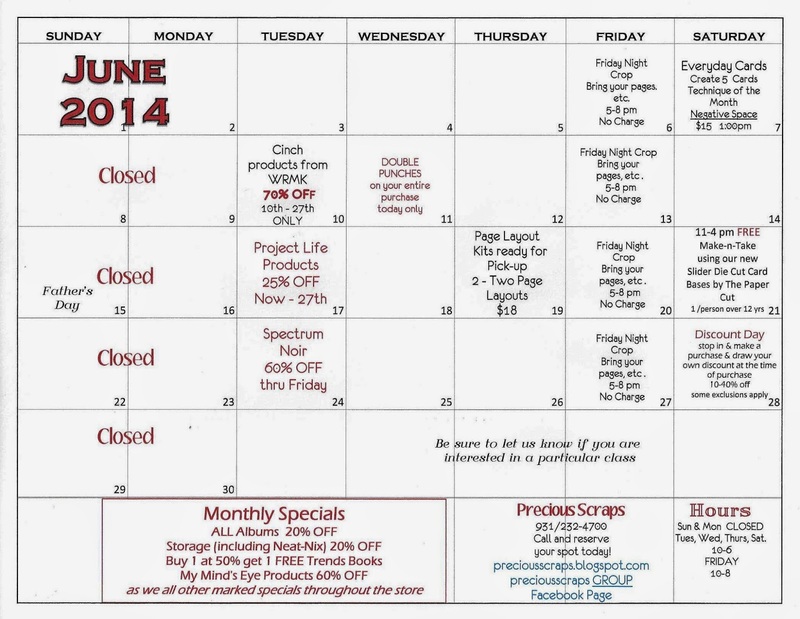 Be sure to stop in and check out all the great sales going on at Precious Scraps today ! All embossing folders 50% OFF, ALL My Mind's Eye 50% OFF and much much more. Also a reminder that we have a Silhouette Class today at 3:30 $10. Come on out and learn how to truly use that machine that is gathering dust in your scrapbook area because you don't know what to do with it ! 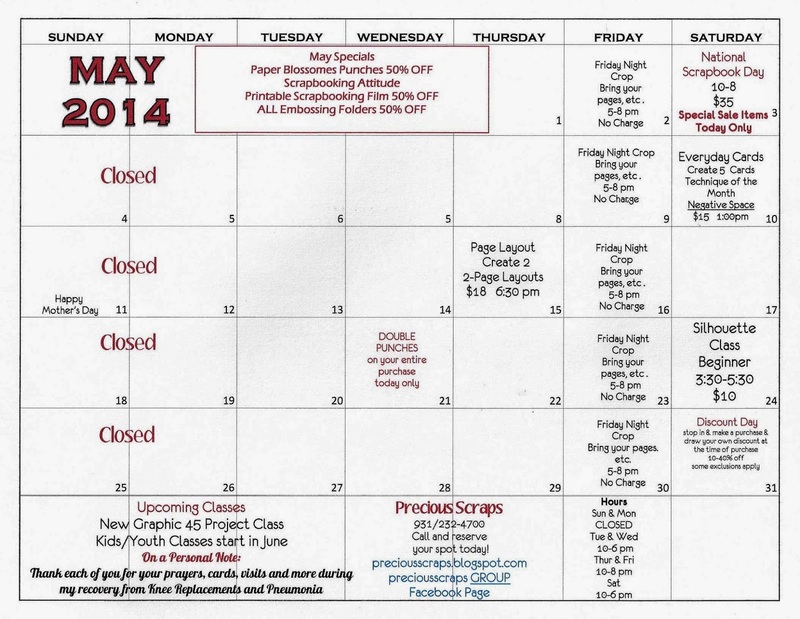 Here is May's schedule. Sorry for the delay. If you follow Precious Scraps Group Page on facebook then you know that I am still in the recovery phase from having Total Knee Replacement. I was discharged today from home health and start my outpatient therapy on Monday. I truly appreciate all of the prayers, calls, cards, and more from everyone. I still get tired very easily and have only been able to stay at the store for a few hours at a time. Lois has been doing a great job taking care of things through the week, and Cori, Tammey and Wanda have greatly helped on weekends. 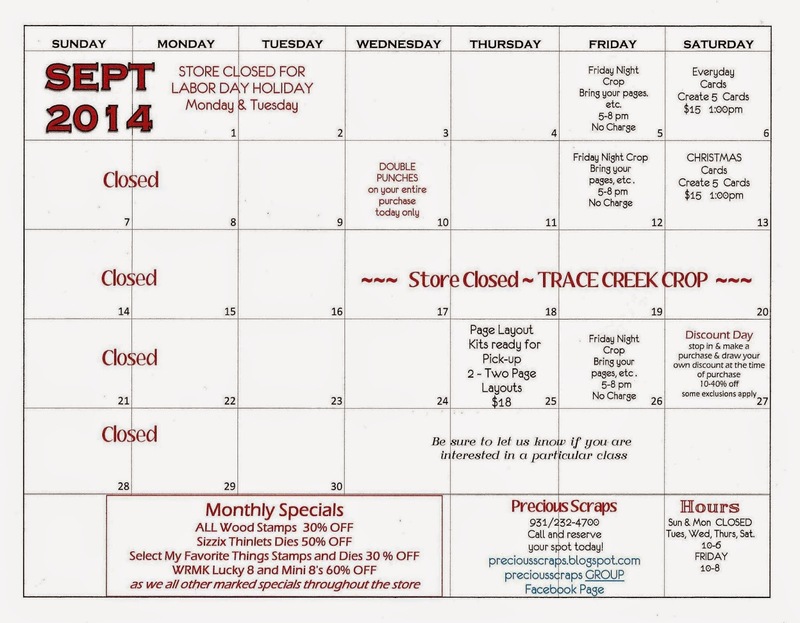 Please be sure to stop in and take advantage of some great sales this month. I would also like to take this opportunity to wish all the mothers a Happy Mother's Day. May God truly bless you.